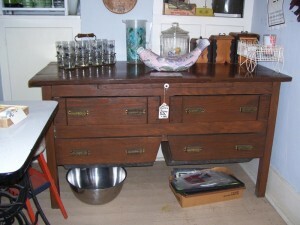 The following comes from our friend Julie Donahue at The Trading Post Antiques. Would you like to take a wonderful two and a half hour ride in the country that lands you in antique heaven? Well, almost heaven. If so, we invite you to get on U.S. 68 north from Lexington, cross the Ohio River at Maysville, and travel to Bainbridge, Ohio where you will find over 20,000 square feet of antiques displayed in three unique buildings at The Trading Post Antiques. 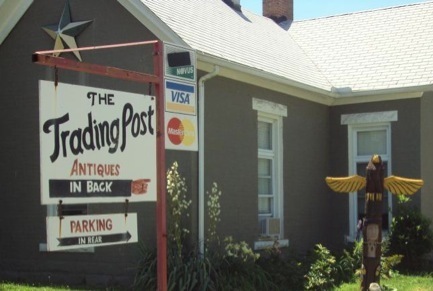 The Trading Post Antiques has been in business for over 35 years. Rosemary Keaton began the store in a barn behind her residence. As the business grew, so did the building. Today visitors find quilts, coverlets, pottery, kitchenware, cast iron skillets, books, washstands, side tables and showcases filled with glassware in the Main Building. Next to the Main Building, Fred’s Shed displays games and toys from days gone by. Yesterday’s Closet has lovely vintage hats and clothing as well as linens. When the house next door became available, Rosemary purchased the quaint Victorian home from Esther’s relatives. Now Esther’s House is furnished in much the same manner as when it was built around 1900 including the icebox in the kitchen. A few years ago, the block building adjacent to Esther’s went up for sale. You guessed it! Rosemary bought The Warehouse and the larger pieces of furniture are on display there. Visitors can find a schoolmaster’s desk, Victorian beds, primitive cabinets, chests, light fixtures, rocking chairs, trunks, more books, records, cradles and lots of lovely pictures and frames. There are always flowers blooming somewhere at the antique complex. Many times people have purchased starts from the Passion Vine that blooms along the walkway between the buildings. Last October, Rosemary passed away at age 82. In an effort to downsize the inventory, we have marked everything at 20% off. We invite you to plan a trip and take advantage of the special savings! Bainbridge is situated in the Paint Creek Valley that ancient prehistoric Native Americans claimed as their home. Many mounds are nearby. The Arc of Appalachia nature conservatory is less than five minutes away. There are lovely trails that are unique to the area carved from the last glacier. A Mennonite community is only seven miles south of Bainbridge where there is a bakery, store, and craft mall. (They are closed on Sundays). 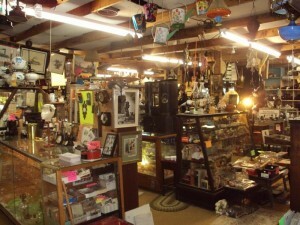 To find out more about The Trading Post Antiques and to plan your visit to Bainbridge, Ohio, please visit the web site – thetradingpostantiques.com. or call 740 634-2867.